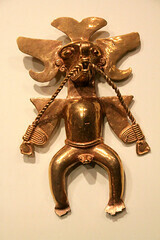 Criticism: Pre-Columbian Americans didn't have or use gold or other precious metals. Response: Simply untrue. Excavations at Zaculeu, and many other sites, have turned up metalwork. Also found at Zaculeu was tumbaga, which is a gold/copper alloy that, when worked into thin sheets, almost perfectly matches the description of the metal the gold plates were made of and is excellent for engraving and was, in fact, used extensively in pre-Columbian America for making religious objects meant to be preserved for ages. Given that none of this knowledge was available to him at the time, is it just Joseph Smith's lucky guess that Moroni would use tumbaga-like metal plates, made of non-corrosive and microbe-resistant metal with a low melting point that is easily pounded and shaped into thin, foil-like leaves for engraving? Metal at Zaculeu was from the Post Classic Period...a thousand years AFTER the Book of Mormon time period. Please be accurate in your claims to people. Some of your buddies are using it for spam on YouTube. Artifacts made of tumbaga have been found to range from 1 A.D. to 500 A.D.